Think of the 24 Hours of Le Mans, and it's hard not to immediately think of Audi. The German brand has, in recent times, dominated the event, managing to win at the legendary Circuit de la Sarthe 11 times. There's only one manufacturer who has managed more wins at the 24 Hours of Le Mans and that is Porsche, with a whopping 16 victories. When news broke that Porsche would compete at Le Mans in 2014, there was much speculation about whether or not Audi would compete against its sister brand in what is easily one of the most demanding endurance races in the world. 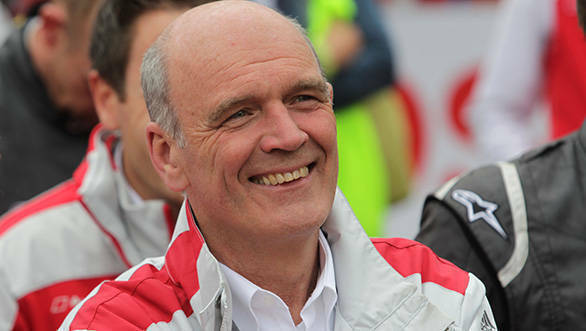 OVERDRIVE caught up with Dr Wolfgang Ullrich, head of Audi Motorsport, to find out exactly how much progress has been made on the marque's 2014 challenger, just ahead of their 2013 campaign. Q. What are your expectations from the 'long-tail' version of the Audi R18 TDI ahead of Le Mans? Are you pleased with the results you've seen so far in testing and at the 6 Hours of Spa? A. We have indeed used the Spa 6 Hours as a dress rehearsal for the long-tail Audi R18 e-tron quattro. This car has been developed with regard to the Le Mans 24 Hours, so this vehicle was not the ideal solution for Spa. We knew that before the race. Hence third place should not be considered as a bad result. In fact, we had certain expectations regarding special criteria following our simulations prior to the race. The car has fulfilled these expectations, that's why we look forward to race it at Le Mans. The tight rules mean that it is useful to have a second aerodynamic version in place for the high-speed Le Mans track. Q. Audi has already had huge success at Le Mans in terms of hybrid technology with the R18 e-tron quattro. Is there constant pressure to further develop your hybrid technology specifically for racing purposes? Can we expect to see more advanced systems gradually making their way onto your racecars? A. When we designed the first hybrid car from Audi, the R18 e-tron quattro for the 2012 season, this was a huge step and an instant success as it won both the Le Mans 24 Hours and the FIA World Endurance Championship (WEC). There is a constant pressure to develop new solutions. From 2014 onwards, car manufacturers are required to have at least one hybrid system in an LMP1 car, and a maximum of two hybrid systems is allowed. So the pressure increases as a car will get even more complex in the future. Plus, there is an entirely new approach regarding the 2014 regulations that put an emphasis on energy consumption. So you can expect to generally see an improved breed of cars in the future in our sport. Q. Can you tell us about the direction that we'll see Audi take with regard to the 2014 season of the World Endurance Championship, specifically in terms of the new rules that have been drafted by the ACO? A. Audi's 2014 race car will be different from this year's car, quite simply because the regulations are so much different. The car's width will decrease by 100 millimetres, the wheels will be smaller in diameter and width, plus the new regulations favour energy-efficiency in every aspect of the car, from the drivetrain to the aerodynamics. The next Audi will be a totally new car. Q. Could you also tell us at what stage of development the 2014 Le Mans challenger is? A. There is always a long-term schedule at Audi Sport to develop new cars. The 2014 car has been developed in parallel to the 2013 evolution of the Audi R18 e-tron quattro. At the moment, we are a bit behind our schedule because the rules for 2014 are not 100 per cent defined yet, but we are optimistic to present the new car in time for the new season. Q. What is your opinion of the regulation changes for 2014? Particularly in terms of the engine regulations that are supposed to increase performance and economy at the same time? A. For the first time, the regulations no longer restrict the power of the car, for example through limiting cubic capacity, the number of cylinders or an air-restrictor. There are obviously some maximum limits of certain parameters, but basically, you could in theory build a small or a big engine, for petrol or diesel, for an atmospheric or a turbo engine. It's just a matter of what the most efficient concept will be as the amount of energy is limited. It is as well linked to the energy recuperated through the hybrid systems. That's an approach which is very interesting and it helps developing new technologies, so it can be of great relevance for road cars as well. That's what we welcome at Audi. Q. Are you considering taking part in the Asian Le Mans and other such competitive series at some point in the future? A. At the moment, Audi has two major programmes in place. In Europe, we contest the DTM touring car series with the Audi RS 5 DTM. On a worldwide scale, we have entered the FIA World Endurance Championship (WEC) last year and we will defend our title this year. The Le Mans 24 Hours is part of that schedule. In addition to that, our customers enter Audi R8 LMS ultra cars in a variety of GT3 series around the world, including Asia. But at the moment, there are no plans to expand our LMP sports prototype program to Asia.